We’d love your help. Let us know what’s wrong with this preview of We Don't Make Widgets by Ken Miller. 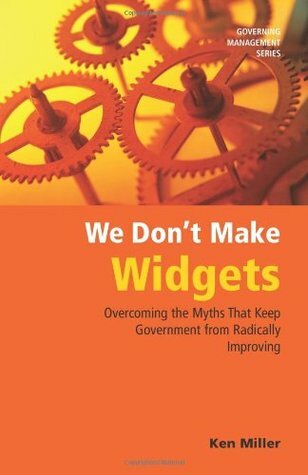 Written for middle- and senior-level managers in state, city and county government, We Don't Make Widgets: Overcoming the Myths That Keep Government from Radically Improving explodes the myths that prevent dramatic improvement in government operations. If you're interested in a new way of thinking about what you do, who you do it for and why you do it, this book - part of t Written for middle- and senior-level managers in state, city and county government, We Don't Make Widgets: Overcoming the Myths That Keep Government from Radically Improving explodes the myths that prevent dramatic improvement in government operations. To ask other readers questions about We Don't Make Widgets , please sign up. This book is amazing- it is just the right length, contains practical yet relatively simple observations and is written with well-deserved authority and humour. It should be mandatory reading for all government staff. I will be looking up more of Ken Miller's work. An enlightening little read that provided a different way of thinking about Government from an employee's perspective. The book proves how Government does, indeed, make widgets, and speaks to the many myths that, unfortunately, results in various outcomes not living up to maximum potential. I got this book for my class. And while it did have some things I could agree with I felt there were some elements lacking. It does offer solutions: not just what I got this book for my class. And while it did have some things I could agree with I felt there were some elements lacking. It does offer solutions: not just what not to do, but what to do. It also talks about the myths of working in government: we don't make widgets, we don't have customers, and we're not here to make a profit. I can agree with the logic behind these being myths and can agree that these mindsets are to the detriment of getting the job done. The idea that motivation alone will lead to satisfaction in employees is just not true in my view. While motivation is super important for employees there are things beyond that that leads to a satisfactory work place. And I've worked at jobs where the motivation is helping the kids, but at the end of the day I also have to take care of myself: my mental health, keeping a roof over my head, and my physical well being. If a job requires you to be constantly on the clock, doesn't pay enough to cover your basic needs or puts you in danger without proper protections then that job has failed with employee satisfaction. Motivation only goes so far. Further, this books get pretty repetitive at times. I felt like the author was just trying to up the page count rather than trying to get new ideas across or trying to clarify the ideas he was presenting. On top of this this book is a little dated. I mean it's only been 8 years, but I was 18 when this book came out and the world has changed a lot since then. funny way to express a doctrine idea--governing is like business. managers need to know make widgets between factory and customer, which is like put their belief and value in detailed, specific, people-wanted actions, improvement and changes. you can read it for fun and get some story about government. easy read and wonderful reading experience. A fairly decent book that helps look at our work in government differently. We are currently going through a process of defining measures and some reorganization, and I got a few ideas that will help. Some practical guides. What is new, is applying this to government offices. Take on the Post Office PLEASE. One of the older government institutions, and one of the worst!. If we can't get it right, how do we plan on fixing the IRS and Health Care. OMG! Pretty straight forward and simple in its presentation. This was a good book with useful information and it was not a boring management book, which is a nice change of pace.